When cow urine falls on degraded land, it releases a lot more nitrous oxide – a powerful greenhouse gas – than if it is absorbed into healthy grass, a recent study showed. This research suggests an additional benefit to the restoration and conservation of the countryside. The ability of livestock to disturb the climate is mainly due to methane, which is released into the atmosphere during the animals’ daily digestion. Livestock urine is a lesser-known factor that damages the climate because it produces nitrous oxide (N2O), which has a heating power stronger than that of carbon dioxide (CO2), the primary cause of global warming. A study carried out by the International Center of Tropical Agriculture (CIAT) and its associates shows that these N2O emissions can be significantly reduced by providing healthy pasture for livestock production. For this study, researchers collected livestock urine from research sites in five Latin American countries and the Caribbean. Samples of 500 mL were released into evenly matched livestock fields, one of which was classified as degraded, the other as healthy, as determined by its vegetation cover. In six of the seven test sites, the degraded farmland released significantly more N2O –sometimes up to three times more. The results were published on Jan. 29 in Scientific Reports, a science magazine, by the publishing house Nature. “Degraded farmland not only affects the safety of our food and the livelihood of current farmers, but also the livelihood of future farmers, because they release more gases that cause global warming,” stated Ngonidzashe Chirinda, a researcher from CIAT and leader of the study. The results intensify the need for global land restoration treaties, such as the 20×20 Initiative, which seeks to restore 20 million hectares of land in Latin America before the year 2020 as an important first step toward even more ambitious restoration goals. The figures vary, but Chirinda offers a conservative estimate that 150 million hectares of degraded earth exist in Latin America. In Brazil alone, there are 80 million hectares of degraded farmland. Degraded land used for livestock farming is generally characterized by overgrazing, soil compression, loss of organic material and low nutrient and carbon levels in the soil. The restoration of earth on a large scale with improved forage grasses, rotational grazing and the addition of shrubs and trees could significantly decrease the negative effects to the climate caused by degradation. Besides reducing N2O emissions, revived countryside generally contains more carbon, has healthier grounds, and more robust and productive livestock. “This study highlights the importance of avoiding land degradation in the first place. Maintaining healthy farmland seems to simultaneously reinforce both the goals of the United Nations Framework Convention on Climate Change as well as the United Nations Convention for the Fight against Desertification,” stated Todd Rosenstock, co-creator, based in the World Center for Agroforestry (ICRAF). The results of the only test site that did not fit with the results of the study – located in Taluma, Colombia – may be attributed to a series of factors that deserve additional research. The N2O emissions in that location were the same both in degraded and healthy farmland. The livestock urine used in the experiment had the lowest content of nitrogen compared with the other research sites, which probably contributed to the results. The foraging grass used there, Brachiaria humidicola, also possesses an especially powerful ability to prevent nitrification, which means that it prevents nitrogen from being converted into N2O. The study is a victory for well-planned science with a modest budget. The project started with a week-long training session in the main headquarters of CIAT in Cali, Colombia, where a team of doctorate students from additional participating countries – Argentina, Brazil, Nicaragua, and Trinidad and Tobago – helped to design a research plan and standardized the methodology of the study. The students returned to their home countries and carried out the experiment to coincide with the rainy seasons in their regions, in order to ensure similar climate conditions in all the sites. (The exception was Taluma, which was sampled during a period characterized by low rain, which provides another possible reason why the emissions of N2O were low there). “The power lies in the number of data points from all the different countries,” Chirinda said. Researchers say the study is a useful step toward the creation of a more detailed overview of the extent of greenhouse gas emissions coming from livestock in Latin America and the Caribbean. 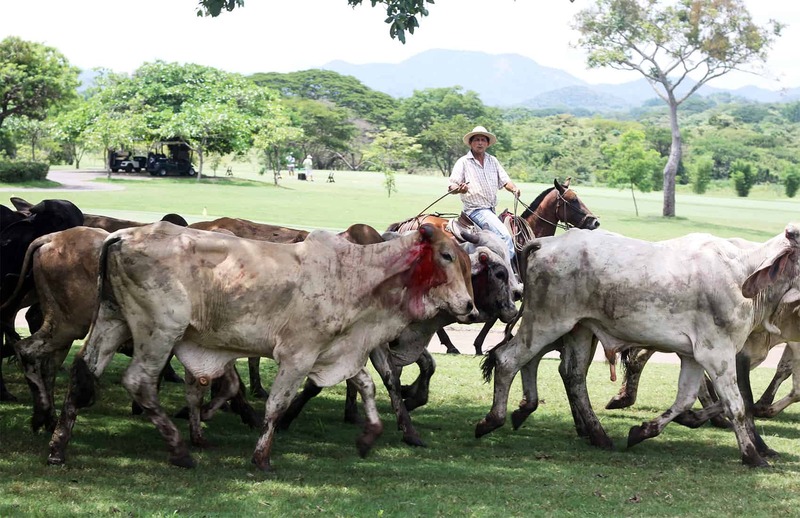 “Given that the study of emissions released by the livestock production in the region is not common, at least this study will provide a piece of information that is lacking in the theoretical estimate of greenhouse gases in the region of Latin America and the Caribbean,” said Miguel Andrés Arango, co-creator and scientist from Agrosavia, Colombia, the biggest farming research organization in the country. “Being able to calculate the real impact of livestock production will allow us to propose potential practices to reduce emissions,” Arango said. “It’s time we know the reasons for these emissions in order to protect our agricultural systems”. The study was carried out by the Network of Greenhouse Gases Alleviation in Latin America (LAMNET) and was implemented as part of the Research Program of CGIAR in Climate Change, Agriculture and Food Safety (CCAFS), which was carried out with the support of donors of the CGIAR Fund and through bilateral financial agreements. Part of this work also relied on the support of the project BBS/E/C/00010320 of the Research Council on Biotechnology and Biological Sciences (BBSRC), granted to Rothamsted Research. The collaborators of this project included researches affiliated with the following organizations: The National Autonomous University of Nicaragua; The National Institute of Agriculture of Argentina; The Federal University of South Rio Grande and the Institute of Forest and Agricultural Management and Certification in Brazil; the University of the West Indies in Trinidad and Tobago; the National University of Colombia, the Department of Agriculture of the United States (USDA) and the University of Vermont. This story originally appeared in Latin Clima and was translated with permission. Read the original story in Spanish here.